At first sight, the similarity with "Costum Design number 5" is obvious (The hidden corridor behind a false wall.) However the circuit here is totally different! The theme is a figure 8 double-tracked line, folded into itself. Each track has its own 4-tracked shaddow-station with space for trains of up to 3 meters. There is also a secondary shaddow-station forming a return-loop for the secondary branch-line. The main station and its areas are obviously over-loaded with stuff, but the modeller here wanted to use both the turntable and the square platform as well as the new Märklin portal crane. The secondary branchline is here shown climbing "only" 20cm from the main station; A further 10cm (a further round of the R2 helix) might be possible depending on the available height to the roof. 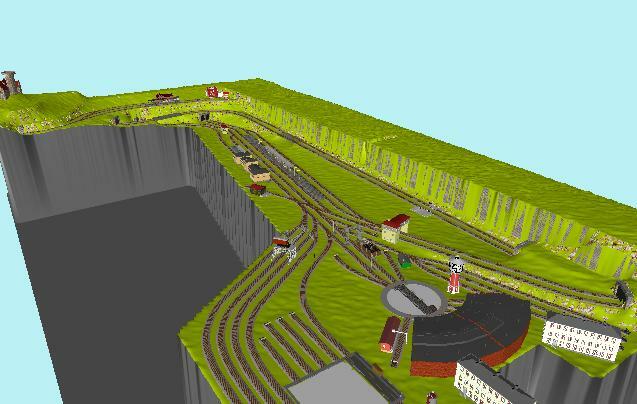 A hidden crossing-station is also implemented on the mountain level. The 255cm long line reaching out from the small goods shed on the main station is for connecting of TrainSafe tubes. The total track lenght is 139m, and I think I must have used almost all of the tricks for stretching the C-track geometry. At least no R1 curves are used in any visible area. The use of some 5 curved switches are for re-using material already acquiered. Use of 3-way switches are held to a minimum. Paradestrecke with second shaddow-station and shaddow-station for secondary line. 3D picture with suggestion for decoration.